An adequate supply of blood flow to the brain is critically important to maintain long-term brain function. However, many issues surrounding the regulatory mechanism of the blood flow supply to the brain remain unclear, such as i) the appropriate range of capillary flow velocity to keep neurons healthy, ii) the size of the vascular module to support a functioning neural unit, iii) the sensing mechanism for capillary flow control, and iv) the role of flow regulation in promoting neural plasticity. A fluorescence technique allows for visualization of the dynamic changes between cerebral microcirculation and neural activity concurrently and thus is capable of addressing these questions. 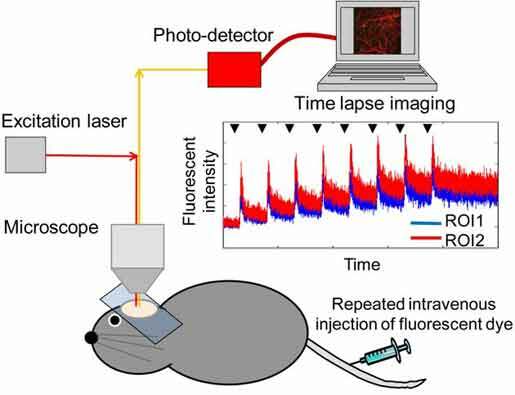 Here, we briefly review the methodological aspects of measuring blood flow using fluorescence imaging in rodent brains and introduce a novel approach for mapping the flow velocity in multiple vessels with laser scanning fluorescence microscopy. The flow velocity was imaged by calculating the traveling distance and time of the instantaneously injected fluorescent tags through the vascular networks. Using the present method, we observed that the average flow velocity in the pial artery and vein was 3.0 ± 1.4 mm/s and 1.6 ± 0.5 mm/s, respectively (N = 6 mice). A limitation of the method presented is that the quantification is only applicable to the vascular networks laid in two-dimensional planes, such as pial vascular networks. Further technical improvement is needed to quantify three-dimensional flow through parenchymal microcirculation. Furthermore, it is also needed to fill a gap between the microscopically measured flow parameters and the macroscopic feature of the brain blood flow for clinical interpretation. Brain Science Inspired Life Support Research Center, University of Electro-Communications, 1-5-1 Chofugaoka, Chofu, Tokyo 182-8585, Japan.